Eric Eggert G e r m a n y 2 0 1 3 – 2 0 1 6 : W 3 C / W A I 2 0 1 6 – t o d a y : K n o w b i l i t y & W 3 C / W A I F e l l o w s h i p T r a n s l a I n g W C A G t o H u m a n .
If you can use a na=ve HTML5 element or aMribute with the seman=cs and behaviour you require already built in, instead of re-purposing an element and adding an ARIA role, state or property to make it accessible , then do so. Do not change na=ve seman=cs, unless you really have to . All interac=ve ARIA controls must be usable with the keyboard. Do not use role="presenta=on" or aria-hidden="true" on a visible focusable element . All interac=ve elements must have an accessible name. 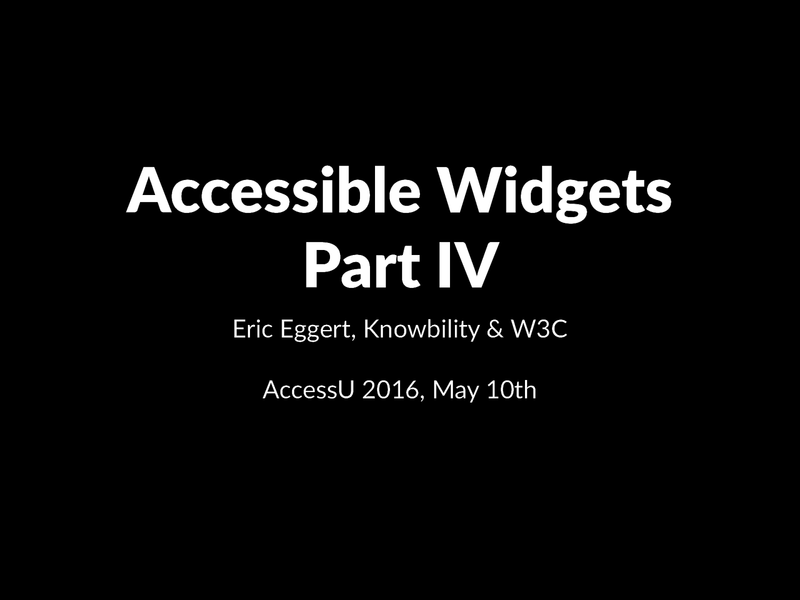 View Accessible Widgets 4/4 (Class).